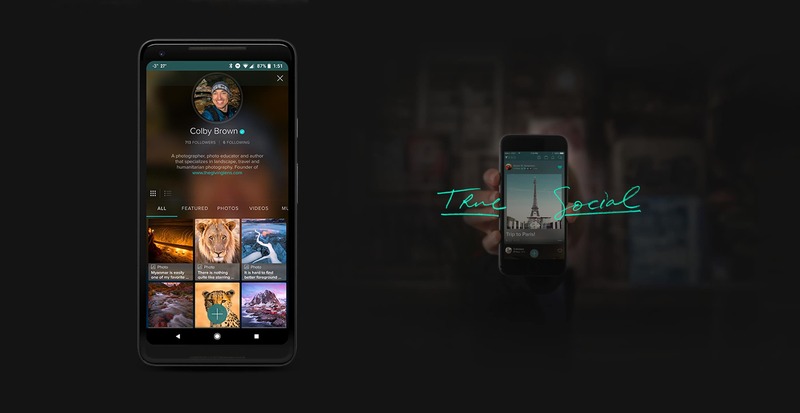 Unless you have been living under a rock for the last week, you have probably heard about the “new” Social Network VERO – True Social which has risen overnight in popularity with photographers all over the globe. Spend a few minutes browsing your streams on Instagram, Facebook or Twitter and you would be hard pressed not see at least one person telling you to sign up. But what is Vero? Do we all really need yet another social platform? And why has it all of a sudden becoming popular? In this article, I will take a look at all these questions as well as give you a quick walkthrough of the platform, how it works and give you some insight on how to make the most of your time on the network! 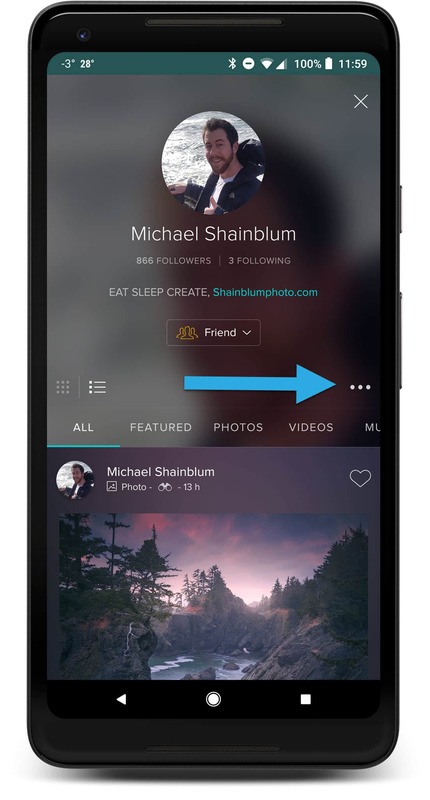 When you first login to Vero it is very obvious that it is a Social Network, with similar core principles to the likes of Instagram or Facebook. It is a place to connect, engage, share and communicate with others. However, regardless of its newfound fame within the online photography community, it is actually not new. It launched in 2015 and has been slowly building up its network since then. So what makes it any different then all of the other networks you are probably already on? In truth…a lot. 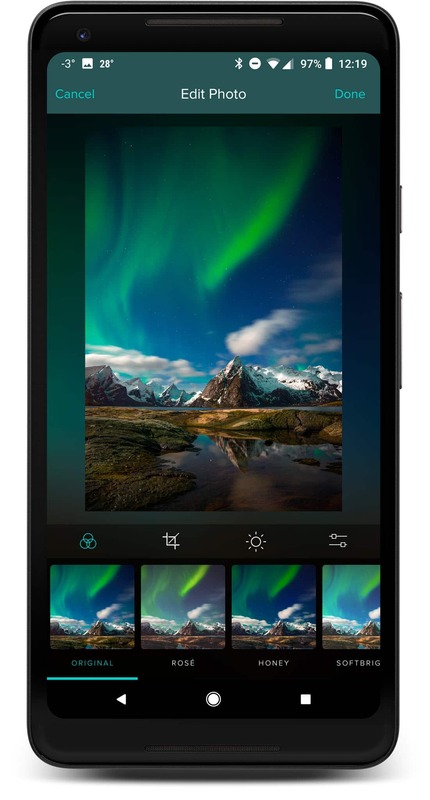 While it looks and functions in many ways like Instagram, it is very much its own beast. One of the biggest differences between Vero and nearly every other social platform is that the network doesn’t use any algorithms to determine what & when you will see things. This means that in theory, you will always see the content being shared from those you have chosen to follow or that you have connected with on the network. For many of us, this is a pretty big deal. I have worked hard to build up a large following on Instagram of 240,000 users. With the recent changes to Instagram’s algorithm, the organic reach of my posts and my IG Stories have dropped by more then 25% in the last 21 days. Not only is this annoying, but it has business and revenue ramifications for someone like myself that makes a living as a photographer. Considering that I am already almost getting more interactions on my posts here on Vero than I do via my Facebook Business page (700 followers vs 124,000 followers), you can see why this has many photographers excited. 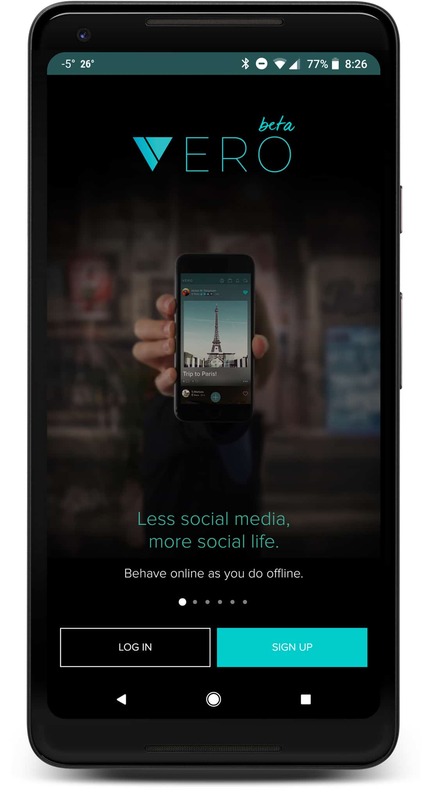 One of the biggest marketing pitches for Vero is the fact that you will never see Ads on the network. For many people, Instagram and Facebook have been ruined by the constant stream of Ads popping up in their feeds. While I can appreciate this mindset, I would be lying if I said that my various different photography companies haven’t benefited from running ads on those platforms. However with that being said, as a user and content creator, it is a breath of fresh air to let the content being share speak for itself for a change. A big complaint for many photographers on Instagram is that the network forces you to crop many if not all of your images to conform to the network’s standards. 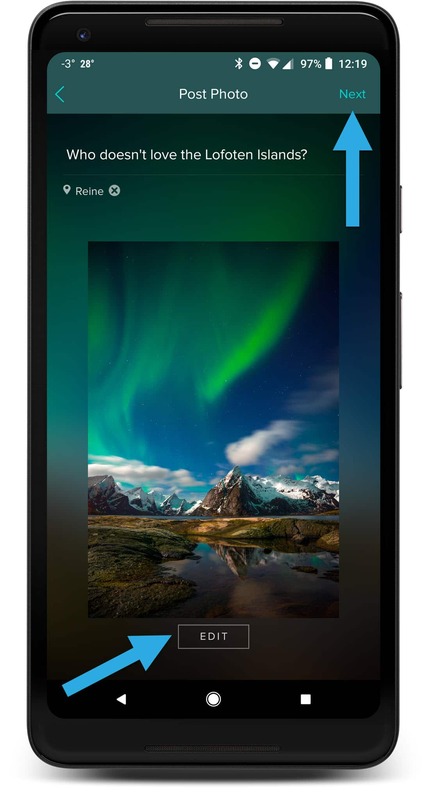 For vertical images, you have to upload (or crop an image) into the 4:5 ratio. It is also recommended that you upload or crop horizontal images into the square 1:1 ratio rather then their full size since it takes up more screen real-estate. With Vero this isn’t an issue. Full sized images are uploaded and displayed beautifully on the network. Another feature I feel most users overlook is that with Vero, they have built in the ability for you to make purchases right from within the network. This to me has some pretty big benefits, especially as a content creator. While I don’t feel this feature is fully fleshed out just yet, I do like the idea of being able to let my followers purchase presets or video tutorials from me right through the network, eliminating one more “barrier for entry” in the process of finding paying customers. Once you realize that you won’t see any Ads on Vero, it shouldn’t be a surprise that Vero would have to make money some other way. Enter the idea of a “Subscription Model”. 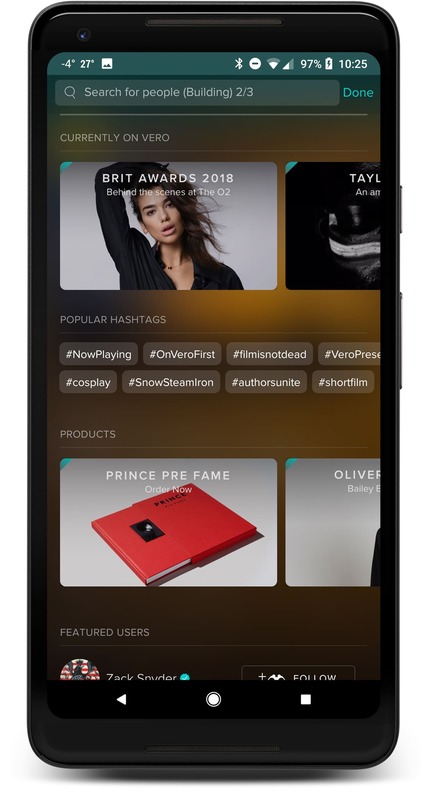 Instead of surviving on Ad revenue like Instagram or Facebook, Vero plans on introducing a paid subscription model for the network once it reaches 1 million users. While controversial to the current status quo, this is really the only possible route a network can go if it wants to stay ad, and arguably algorithm free. How much it will cost is pure speculation at this moment, but I imagine it will be pretty nominal if they hope to ever reach the same heights as a platform such as Instagram when it comes to a user base. All this being said, as long as you sign up now, you will NEVER have to pay a thing. You are automatically grandfathered into a free account as long as you get on the network before they cross that one million user threshold. *With the viral rise of Vero that has caused a number of server errors, Vero has publically announced that all new account signups will be free for the foreseeable future. They will make another announcement when they will finally implement the paid subscription model for everyone else signing up down the line. While the online Social Networking scene is very crowded and competitive, the reality is that most of us are not happy with what is currently being offered. When was the last time you were excited to log into Facebook? Can you remember a time when you enjoyed the changes Instagram made to its network? What about the last time you thought 500px did a good job of highlighting exceptional work? While there has certainly been a number of networks pop up and try to make a name for themselves with the photography community (Google+, Ello, 500px), the height of our current dissatisfaction with all our choices might just be enough to reward a unique and different approach to Social Media such as we have with Vero. With all this being said, it doesn’t hurt that Vero’s is a pretty great looking network. Not only is the UI beautiful and seamless but images look great on the platform as well. I have yet to see any gradation or loss of image quality with my images, something common on both IG and FB because of how aggressive those networks are with compressing our images down to their smallest files sizes possible. Once you have decided that you want to give Vero a shot, the signup process is pretty straightforward. Because Vero is currently a “mobile only” platform, you will need to start by downloading the Android or IOS Vero app HERE. 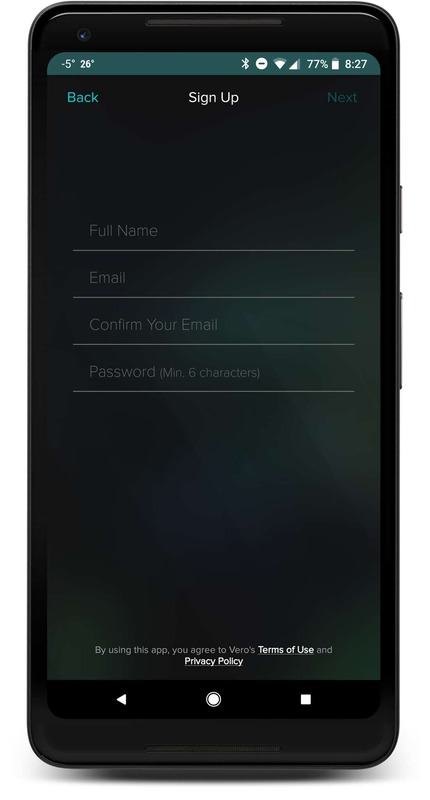 Once you have installed the app and opened it for the first time, you will be greeted with the Login / Sign Up screen. Select Sign Up and then fill out your Full Name, Email, and Password. Next, you will be asked to enter your phone number. This will stay private and not be shared with anyone on the network. 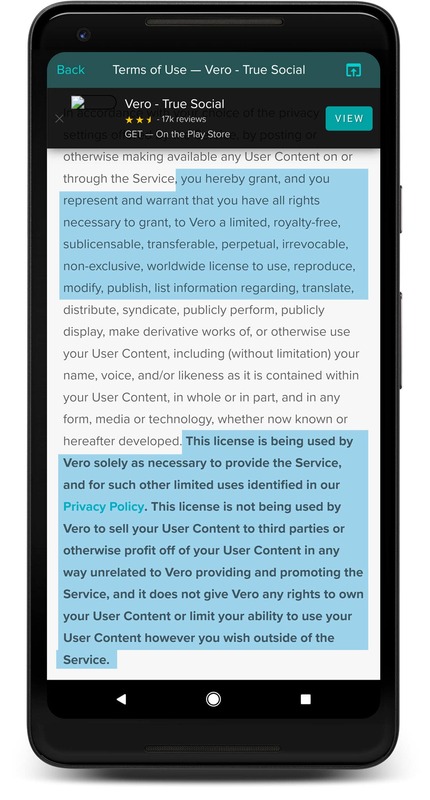 So why does Vero want your phone number to sign up? The answer is threefold. First, they want to be able to authenticate your account. Phone numbers are much more difficult to fake than an email address. 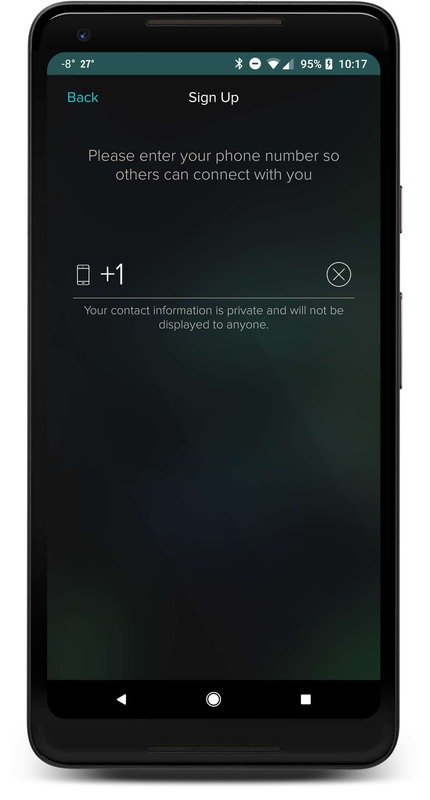 Second, just like with What’s App, anyone that knows you personally enough to have you on their phones contact list will easily be able to find you on the network and connect with you. And lastly, even if you decide to turn off “Connection Requests”, people that have your number can still try to reach out. This gives you some protection from getting requests from people you don’t know while still giving you an option to connect with those you know personally or professionally. Once you have verified your phone number, you are essentially ready to get started on the network by fully filling out your profile. 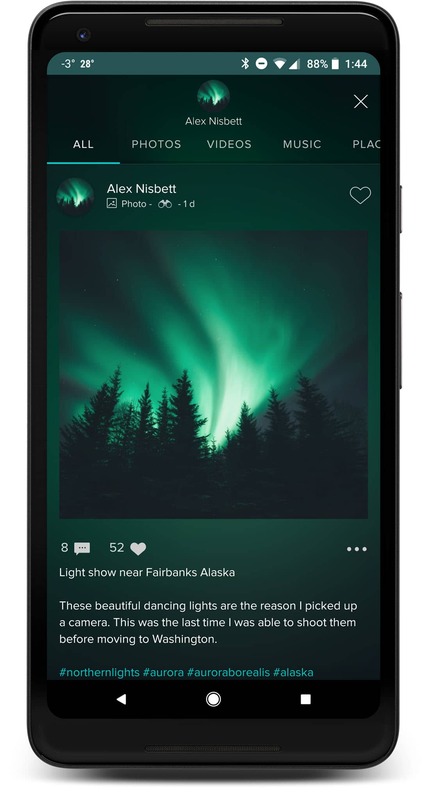 Navigating through any new social platform can be a challenge, so let’s take a look how Vero is laid out within the mobile app. These screenshots are taken from the latest Android version (As of February 25th, 2018), but I believe both IOS and Android are on parity in terms of features and the general look/feel of the platform. When you first open the app, you will be greeted with your “Main Feed”. This, like other social platforms, is where you will see a stream of posts from those you are either connected to or choose to follow (more on that later). Here you can like an image or a post by either double tapping it or hitting the heart in the upper right-hand corner. 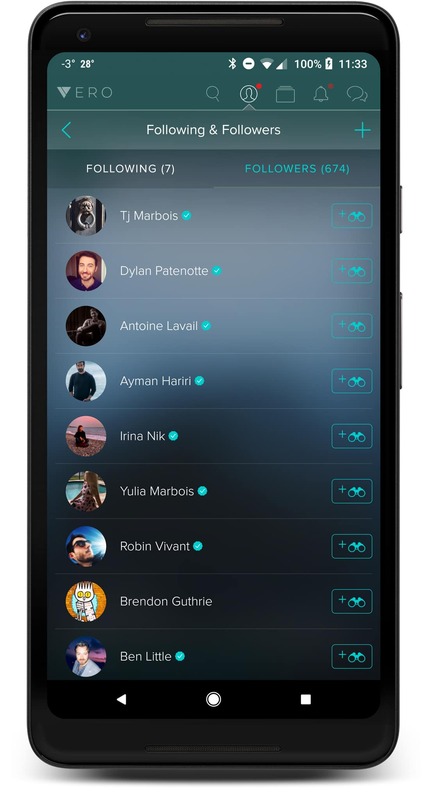 Click on the users Avatar or any of the included Hashtags, and you will be taken to those respective pages within Vero. 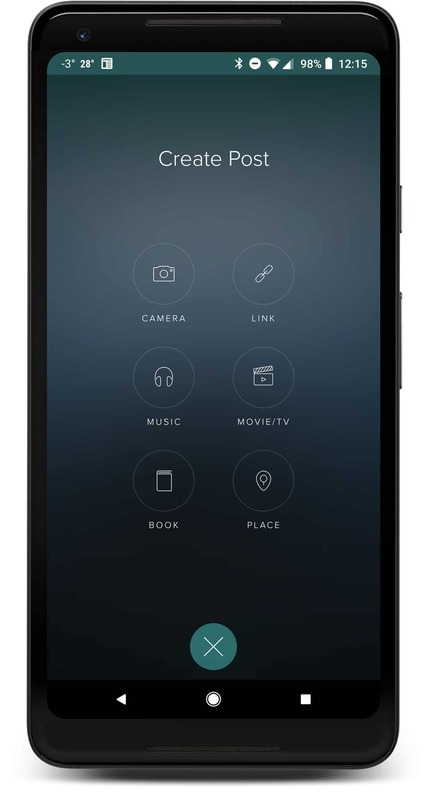 At the top of this screen, you will find a navigation bar with five different icons. First on the list is the Discovery page (Magnifying Glass). Here you can discover all sorts of content from other users on the Network. You can search the platform for users or content, find out what is popular or check out who they recommend you follow. 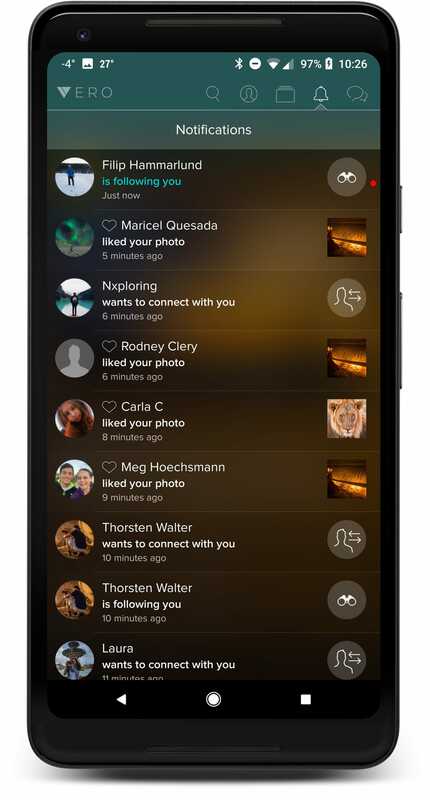 Next, you will see your User Dashboard (a person inside a circle). There you can edit your bio, take a closer look at your Connections and Followers, look at a stream of your own posts, see who has requested to connect with you and look at the app’s settings. Next, you will see the Collections icon (Box with lines above it). Here you will find an easy way to compartmentalize both the content you share as well as what has been shared with you. 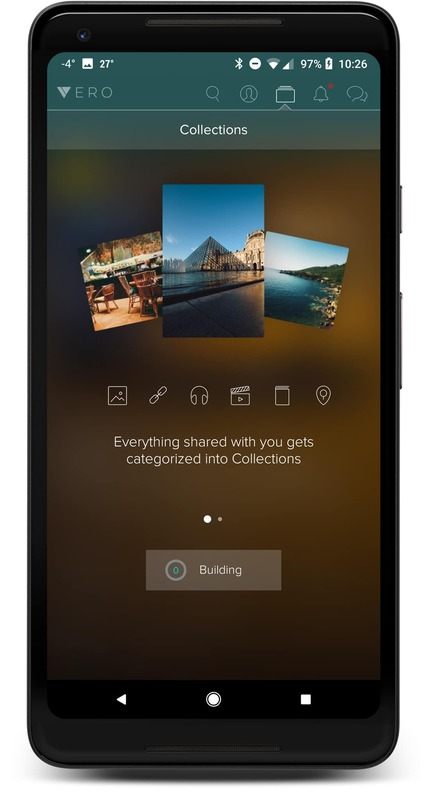 You can organize things by photo, video, location, movie and much more. Next, you have the Notifications icon (Bell) where you will see a list of all of your most recent notifications. 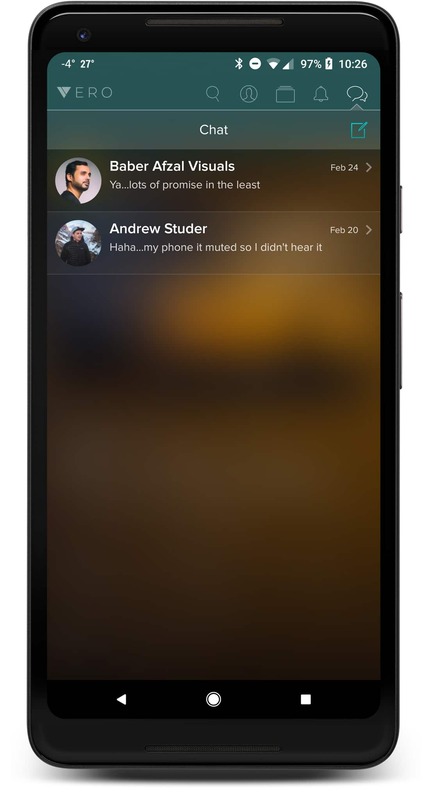 Lastly, we have the Chat section of the app (Quote Boxes). This is where all of your private and group chats will live within the app. Currently, it looks like you can only send text and photos between users, but I would guess sharing videos and other content might come down the line. One of the most important distinctions to understand on any social platform is how Users can connect and engage with each other. 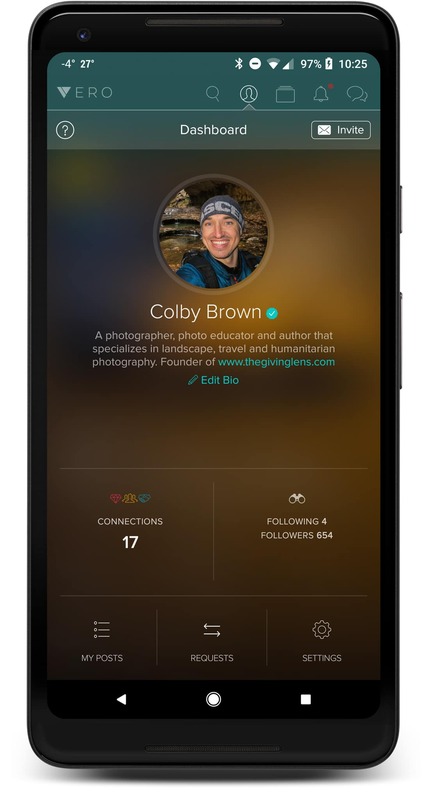 Similar to other social networks, Vero gives you the ability to either make a “Connection” or “Follow” another user. So what is the difference? When you “Connect” with another Vero user, you are establishing a two-way relationship. You can share content with them and they can share content with you. Additionally, within that Connection, you have the ability to classify those contacts into three distinct classes: A Close Friend, Friend or Acquaintance. 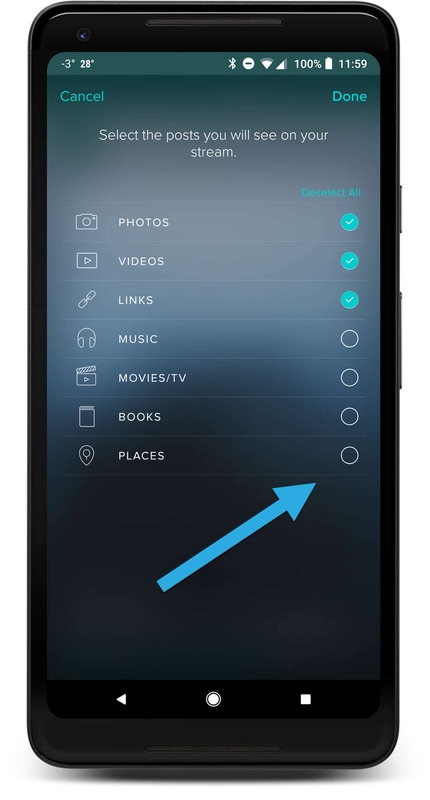 This simply gives you the ability to choose who you want to share content with at any given time, such as sharing a private photo with just your close friends on the network. In a similar fashion, you can also “Follow” someone on the network. This means that you’re are interested in what they have to share on the network, but that you might not know them personally. Anything they post will appear in your stream, but your content will not appear in theirs. Regardless, if someone Follows you or you make a Connection, that person will see the work you share on the network itself. 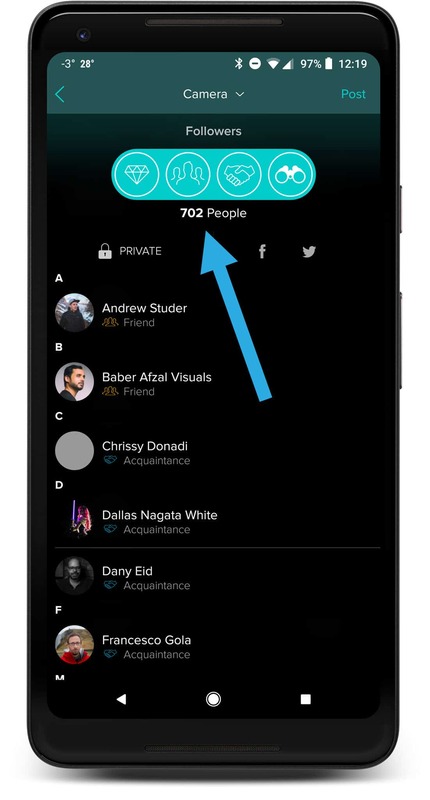 A pretty sweet hidden feature within Vero is the ability to select the kind of content you want to see from the people you follow on the network. For example, if you follow another photographer and want to see only see images from them, you can ask Vero to only show you photos from that user and avoid any of their music or movie recommendations. 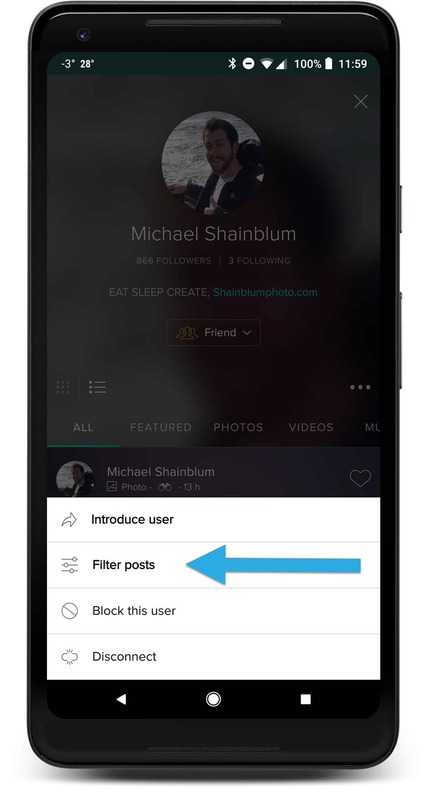 You can access this feature by going to that user’s profile, clicking on the three dots found just below their profile photo (on the right side) and selecting “Filter Posts”. Now that you are ready to share content on Vero, there are a few things that you should know. First, unlike other social platforms, Vero gives you the ability to create a post wrapped around a number of different kinds of content: Photo, Video, Link, Music, Movie/TV, Book and Place. Since most of you reading this are photographers, I will walk you through sharing an image. Once you have clicked on the create post button (+ sign at the bottom of most screens), you will be taken to a screen where you can select the kind of content you wish to share. Click on the “Camera” icon to share an image. 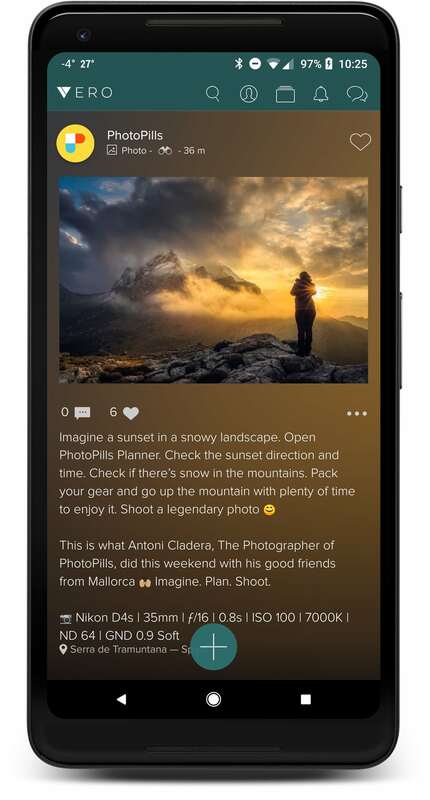 After selecting your image, you can now write your post caption as well as attach a location to it. Vero uses FourSquare for this service. If you need to alter your image, you do have a few editing tools available to you by hitting the “Edit” button below your image. When you are ready, click on the “Next” button in the top right-hand corner. Now you get to choose who you want to share this image with. Here you can select one of the categories you have classified your connections into: “Close Friends”, “Friends”, “Acquaintances” or Followers. The number of people that can see your post will appear just below your selection. Additionally, you can choose to just share it with just one person or a small handful of individuals if you click on the “Private” button and then choose which users to share with. Sharing on Facebook & Instagram are also options if you have connected those accounts to your Vero profile. How Can I Grow An Audience? One of the biggest reasons most of us are on Social Media, to begin with, is because we want to be able to connect, engage and share our content with others. This doesn’t work out so well when we struggle to build a following. I think this is one of the main reasons why Facebook and Instagram have left so many photographers frustrated these days. 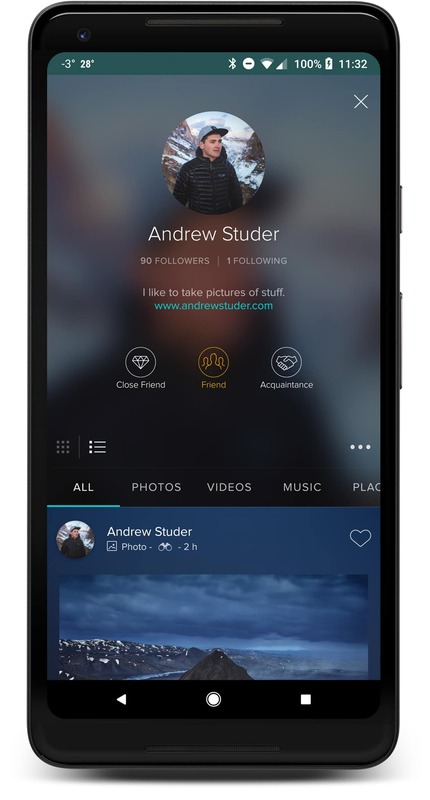 So when it comes to Vero, how do you build an audience? Right now Vero is pretty popular within certain photography communities, which means there are benefits to getting on the network now. Just like Instagram users that signed up on Day 1, there is a benefit of simply being active on the network early, especially if the network really takes off. One of the quickest ways to grow a small following off the bat is to try to bring people to Vero that you have already established relationships with from other platforms. Post about it on Instagram, Twitter, Facebook and maybe even your newsletter. 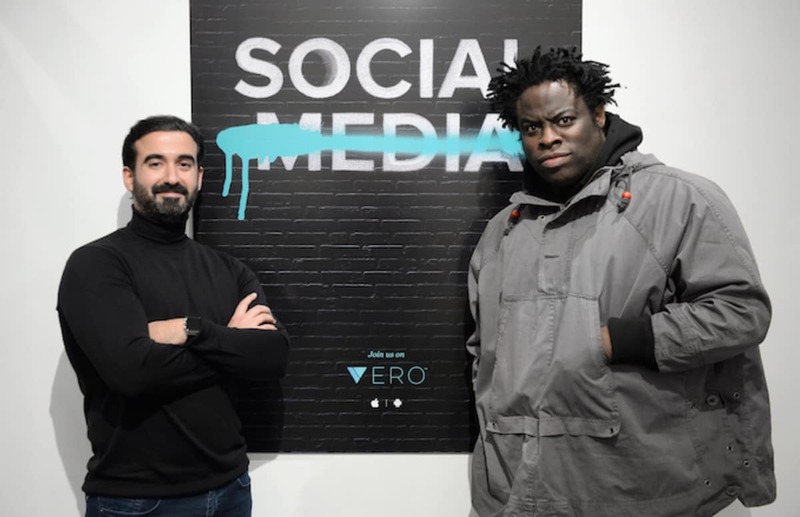 As more people find out about it Vero, the network will continue to grow, so you might as well take advantage of the connections you have already worked hard to build elsewhere. The use of hashtags on Vero is one of the best ways to get your work seen by more people on the platform. From my understanding, when you post an image to everyone you are connected and you use hashtags, Vero will allow your image to show up when people do hashtag searches on the network. This will give you a higher probability of having your content discovered by people interested in the kind of content you are sharing. I don’t recommend you over do it though, 4-8 hashtags should be more than enough as long as you keep them on point! This list should give you a few people to follow that have already standing building their own following. Many of their posts are already getting a good amount of interactions, providing the opportunity for you to engage with both these users and those already engaging with them. The more you interact with people, the more you will get out of this (or any) social platform. If there is one thing that is for sure with the internet, it is just how quickly the mob and torch mentality can come into play. A few days after Vero started to go viral, a number of photographers began to cry wolf, attempting to start a #DeleteVero campaign that has all but fizzled considering they now have over 3 million users and growing. What About the CEO of Vero? Additionally, a number of photographers have been sharing information regarding CEO of Vero, Ayman Hariri, and more specifically an incident that happened with his previous company, the now defunct “Saudi Ogre”. A number of years ago, Saudi Ogre was contracted for a massive building project in Saudi, where they brought in thousands of Filipino workers. It is said that Saudi Ogre failed to pay workers for a year and eventually abandoning the project, and the workers as well. The initial reports were that Ayman was in charge at this time, which turned out to not be accurate since he left the company a few years prior to this happening (LINK). Additionally, it turns out that it was the Saudi government that had failed to pay Saudi Ogre billions of dollars it owed for the project, leaving the company in a position where it couldn’t fulfill their obligations (LINK). In the end, the Saudi Government came and bailed out these workers, but they were also the ones to blame from the beginning. Of course, a number of Social Media influencers failed to actually look into the validity of any of these claims before trying to dissuade people, but this is the internet after all…and none of us should be all that surprised. There is no telling if Vero is going to take off and be the next Instagram or fade out after a couple month or years down the road. When it comes to social media, people can be very finicky to say the least. While they complain about FB or IG, they often don’t give new networks a true chance, after all, change isn’t easy for everyone. In addition to that, Vero isn’t perfect. In the last few days with the influx of new users, servers have been going in and out and the app (which is still in BETA) has crashed a few times. All that being said, I am still pretty excited about the potential I see here. The Vero app experience is a beautiful one that allows our images to be displayed in all their glory. The idea of a subscription-based social platform is one many (although not all) have been asking for for years after being put off by the constant stream of ads, algorithms, and negativity found on most social platforms today. I am not sure if Vero will be the next big thing, but I am willing to give it a chance to find out! I would love to hear from all of you. Are you on Vero? If so, how can other people find you? Let me know in the comments below and be sure to share a little about yourself as well, so other Vero users can get an idea of what to expect if they decide to follow you on the network!